Six members of the Friends met today for a marathon two hour litter-picking session. Most of the time was spent in the wood. We did managed to fill ten bin bags of rubbish and one with recycling. There was a surprising amount of punctured footballs, broken umbrellas and piles of magazines from next door’s Sainsburys. We put these to good use and stacked them in the bug hotel. 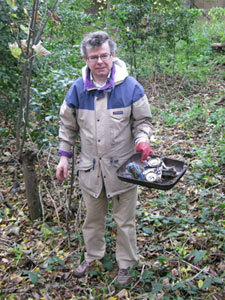 A lot of rubbish was also found on the path that runs along the chainlink fence towards the Greendale. We did the best we could but there’s still a pile of large objects that we couldn’t remove. 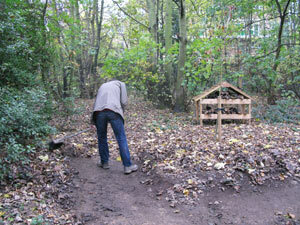 We also cleared the paths of leaves and dug out the self-seeded locust trees from the wildflower meadow. These have long roots so they could easily come back in the Spring.